A Split System LG AC unit can be an essential product for your home, especially in the heat of summer when you want to keep the inside temperature bearable. These products are widely available in different sizes, different styles and completely different types, so you need to decide which one you feel will benefit you the most. There are some factors you should take into consideration before making a final decision. One of these is the efficiency of the unit. While you want your interior air to remain cool, you don’t want your energy bill to sky rocket through the roof, which is why you need to pay very careful attention to the overall efficiency of the product and choose one that won’t break the bank every time you switch it on. Split System LG Air Conditioner fit this bill admirably. Another important consideration, is while you can depend upon an Split System LG Air Conditioner, for other brands, you need to ensure the air conditioner you are looking at is reliable and dependable. Once installed you don’t want to replace the product any time soon, it should last for years, providing your family with cool temperatures in the home while it’s sweltering outside. Ensure you visit some stores and see the air conditioners working. Because the product is being placed in your home, the last thing you want is excessive noise, making it hard to relax or watch television. You want a product that will run quietly while providing your family with cool air, or in the case of reverse-cycle, warm air as well . 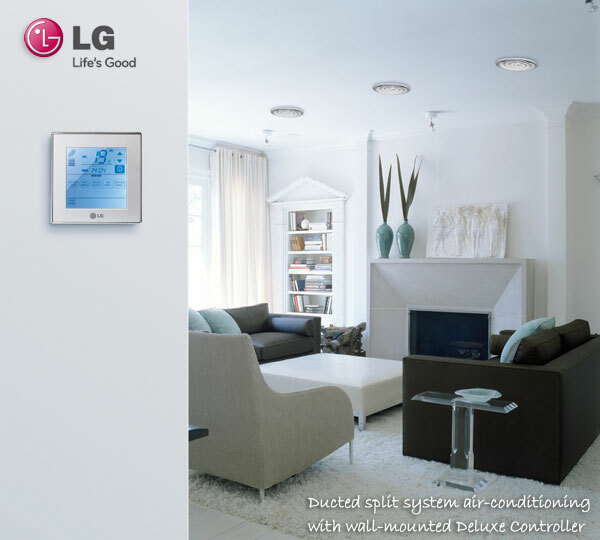 Split System LG Air Conditioners are amongst the quietest in the industry. The size of the unit is exceptionally important and you should discuss this in detail with the companies you are speaking to about supply. You don’t want a unit that is too small, as it won’t be able to keep the space cool and too big, also has negative impacts on your energy efficiency, not to mention is overkill. You need the best solution for the size of your home; based on number of rooms you require cooling and the size of those rooms. When looking at a Split System LG Air Conditioner as well as various air conditioners available, you will notice you can choose between wall mounted and central options. Wall mounted are stylish in design and are placed on a wall, cooling a single room. Central units on the other hand provide a complete cooling system throughout the home, using ducts to cool the home in summer months. With a Split System LG Air Conditioner you’re selecting a company that you can be comfortable with and that has extensive experience and knowledge in air conditioners. This way you can trust their recommendations and suggestions based on the size and number of rooms you have in your home. Ensure you check on their Split System LG Air Conditioner installation procedures; see how long it will take for delivery and how experienced their team is on installations. With our Split System LG Air Conditioner boys on the job, you get peace of mind that you have a trustworthy and experienced team in your home that will do a top quality installation job, which will offer you faultless Split System LG Air Conditioner service for many years to come. So you won’t forget to include a Split System LG Air Conditioner in your wish list will you?